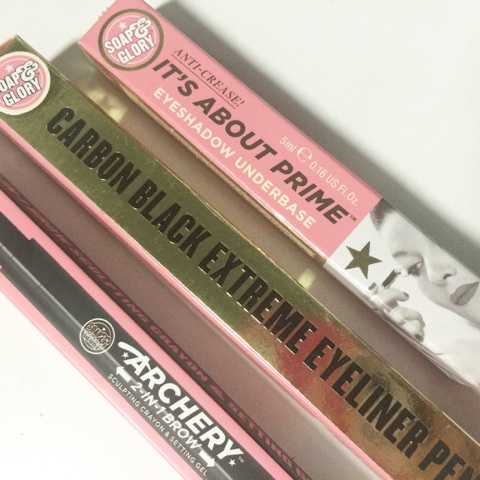 The Hit: Carbon Black Extreme Eyeliner Pen - I love the Soap & Glory eyeliner pen, I am useless at gels and anything remotely skilled, I end up just looking rediculous. The felt tip on the pen provides me with the ability to leave the house looking somewhat presentable, its easy, quick and super black. Perfect. The Miss: Archery 2-in-1 Sculting Crayon & Setting Gel - My eyebrows are dark, I know this - so I wasnt too optimistic about the Archery colour selection - but I thought I would try it out anyway. I was right, the brown isnt quite brown enough... leaving my brows looking no different, or silly where the colour doesn't match up. The 2-in-1 option also comes with the built in gel too, which again I was not impressed with, it just doesn't hold as well as others I have tried, doesn't really seem to hold at all. Allround a failed product for me, wishing I had spent my money on something else. 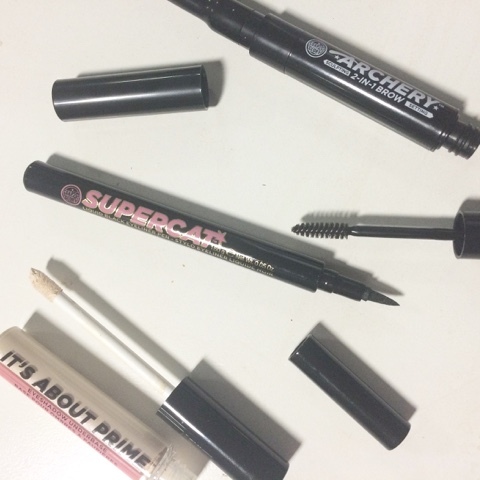 If you are looking for a good brow product I would completely recommend finding an eyeshadow to suit, (i usually use UD Naked Palette, or a Revlon Single in Brown) a Real Techniques eyebrow brush, fill them in and set with the Loreal Brow Plump Artist in Brown. Done! The Meh: It's About Prime - The Soap & Glory Primer has fantastic packaging, and the aplicator is fantastic, but its just not as good as the Urban Decay one, the staying power simply isnt as longlasting. Basically if I emptied this and filled it with the Urban Decay primer it would be the perfect combo... but I believe UD are updating their packaging... so this will do in the meantime! Whats your opinion on these products? Should I have picked up something else? Let Me know in the comment section below?